Ranked one of the best cities in which to live, Peoria, Arizona, boasts 300 days of gorgeous sunshine. In addition to its great weather, it also has a plethora of exciting entertainment venues, a multitude of picturesque parks, a thriving arts and culture scene, and numerous other desirable amenities. When you look more closely at all this spectacular city has to offer, it isn’t difficult to understand why it is such a popular destination among homebuyers in the Grand Canyon State. Among its many splendid attractions is the Arizona Broadway Theater. Nestled in the Peoria 83 Entertainment District this fine dining venue regularly hosts highly acclaimed Broadway shows. In the city’s Old Town, you’ll find the Peoria Center for the Performing Arts which is the stage home of a nationally recognized community theater known as Theater Works. Adding to the excitement and appeal of Peoria, the Peoria Sports Complex serves as the spring training destination for the Seattle Mariners and the San Diego Padres. In fact, when you buy a home in Peoria, you are only minutes away from enjoying MLB, NFL, NBA, NHL, NASCAR and major college sports. This extraordinary city also has abundant opportunities for outdoor recreation. 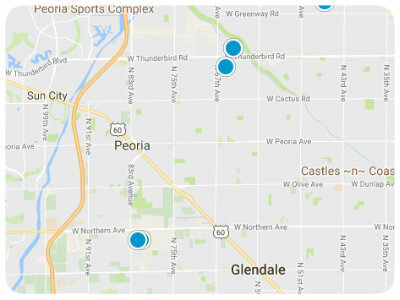 There are thirty-three neighborhood parks and two regionally recognized community parks in Peoria. In the heart of the city, you’ll find the 52-acre Rio Vista Recreation Center and Park, boasting a first-rate skate park, volleyball courts, softball fields, an urban fishing lake, batting cages, and a state-of-the-art recreation facility. The 84-acre Pioneer Community Park is located in the southern part of Peoria and provides a 5-acre fishing lake, multiple athletic fields, and a dog park. On top of all of that, there are over twenty-five miles of trails to hike, bike or jog in this fabulous city, not to mention it is home to Lake Pleasant and Lake Pleasant Regional Park. With all of this, plus exceptional schools and breathtaking vistas, Peoria is a wonderful place to buy a home. Within Peoria, you will find a multitude of truly remarkable neighborhoods and subdivisions from which you may choose. Among the most noteworthy is Terra Vista Estates. Terra Vista Estates is an esteemed residential community that is served by Terramar Elementary School and Mountain Ridge High School. You’ll find Terra Vista Estates south of Weir Wash Trail, north of West Happy Valley Road and west of 68th Drive. Homes for sale in Terra Vista Estates come in various sizes, architectural styles and in a broad price range. The northernmost street in the neighborhood is West Antelope Drive, the easternmost street is North 68th Lane, the southernmost street is West Avenida Del Rey and the westernmost street is North 70th Lane. The neighborhood is also home to West Jackrabbit Lane and West Cottontail Lane. If you would like to learn more about Terra Vista Estates real estate, please allow us to assist you and contact us today.